discriminate against American college grads, in favor of. . .
foreign college grads who have just graduated from. . .
one specific university that had been on the edge of being put out of business. How much? More than $48,000,000 in 2017. That's to employers of former foreign students from just one visa mill. In one year. Doling out the subsidies is the Optional Practical Training (OPT) program; the subsidy takes the form of exempting both the foreign worker and the employer from paying payroll tax, based on the fiction that the workers are still students. We estimated earlier this year that 240,000 aliens' jobs were subsidized by this program, and it reduced payments to the Social Security and Medicare trust funds by $2 billion a year. This specific flow of the $48 million goes to the employers of alumni of Northwestern Polytechnic University, of Fremont, Calif., which was in danger of losing accreditation until U.S. Secretary of Education Betsy DeVos made accreditation easier for marginal universities. NPU, meanwhile, manages year after year to operate at an almost unbelievable profit ratio of 71 percent. For every $1 it received in tuition (there are no reported donations to the place) 71 cents goes into the university's fast-expanding brokerage account. These remarkable financial returns are reported routinely to the IRS on NPU's form 990, a sort of 1040 for nonprofits. NPU is regarded, for some reason, by IRS as a charitable enterprise. It is run by an American Chinese family named Hsieh and most of its students (or maybe "students") are from India. A few years ago it was accredited by a marginal accreditation agency, Accrediting Council for Independent Colleges and Schools (ACICS), in a stage-managed manner that drew a long, devastating article by BuzzFeed. The headline for that story: "Inside the School that Abolished the F and Raked in Cash"
None of these derogatory facts about the place has made any impact on NPU's continuing ability to cause the admission of thousands of lightly qualified foreign students a year. Homeland Security's ability to wear blinders on the visa mill issue persists year after year. Despite the tiny percentage of tuition actually spent on education at NPU, it is the second largest producer of Optional Practical Training alumni in the entire nation, following only the massive New York University, according to new government statistics. The top five schools, in terms of the alumni in these subsidized jobs are: NYU, 6,199; NPU, 6,060; University of Southern California, 5,844; Columbia University, 5,590; and Northeastern University, 4,359. The four other than NPU are very large institutions with extensive foreign and domestic student populations and are in the mainstream of American higher education. I wrote above "the government has revealed how much ..." That revelation is not to be regarded as a bit of transparency. The raw data – with no dollar figures attached – was pried out of some Homeland Security statistics on the Optional Practical Training program, which never mentions the subsidies, the rewards to employers for hiring foreign, rather than resident (citizen or green card), college grads. So: 6,060 x $50,000 x 15.9% = $48,177,000 a year, for NPU grads alone. 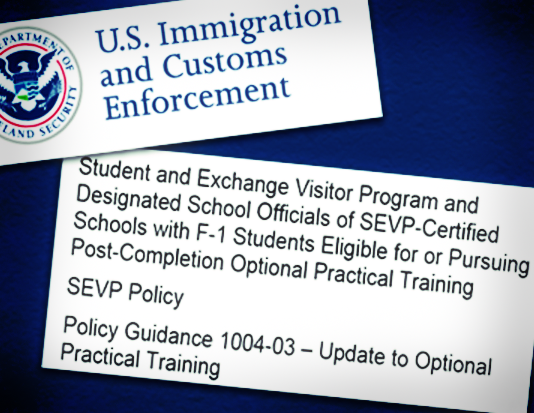 The DHS agency in charge, the sleepy Student and Exchange Visitor Program (SEVP), describes the population as "Students with OPT Authorization", although nearly all of them are alumni, not students. While NPU ranks second among OPT authorizers, there are other interesting institutions on the list of the top 100 OPT providers as well, such as the late, unlamented but 11th ranked, Silicon Valley University, in San Jose. It reported 3,127 of its alumni were in the OPT program. SVU was shut down by California authorities this past spring after it lost its accreditation from the low-standards ACICS. The problem: SVU would not submit an audited financial statement to ACICS after it was revealed that its departing president had taken an undocumented $12.5 million "loan" as he left the place. Academy of Art University (California), last reported as facing federal fraud charges on its enrollment methods, ranked 43rd, with 1,741 alumni noted as OPT workers. University of Bridgeport (Connecticut), a once-failing institution taken over by the Moonies, and an early large-scale user of the OPT program; it ranks 75th, with 1,075 alumni on the 2017 OPT list. Wright State University (Ohio), which was forced to pay the feds $1 million for the misuse of the H-1B program, ranked 85th with 993 alumni in OPT positions. Virginia International University is a controversial entity linked to the conservative (but non-terroristic) Islamic cult of Fethullah Gulen, the self-exiled Turkish cleric living in the Poconos. It ranked 87th with 965 alumni in OPT jobs. New York Film Academy is on this list because of the seemingly lopsided number of OPT alumni (856), all by definition recent graduates, compared to active students (932). It is 95th on the list. This ratio, which indicates that an alien U.S. college grad can secure OPT benefits after a little more than a year in school, will be discussed in a subsequent posting. It is noteworthy that though these seven of-interest institutions play, collectively, a minuscule role in American higher education, they all are on the list of the 100 top users of the OPT alien alumni subsidy program. Does this say something about the OPT program? I think it does.